A graduate of Wellesley College (BA) and the University of Delaware (MA), Alice Wolf Gilborn is the founding editor of the literary magazine Blueline (1979) now published by the English Department SUNY Potsdam. 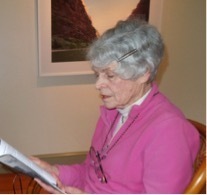 She worked as Editor of Books and Publications at the Adirondack Museum for 15 years, and also as an editor at Westview Press and the Chipstone Foundation. Books published include a memoir of her mother, What Do You Do With a Kinkajou? (Lippincott,1976; revised 2016) and Out of the Blue: Blueline Essays 1979–1989 (Potsdam College Press, 2013). Her poetry and essays have appeared in numerous magazines, journals, and anthologies, and her poetry chapbook, Taking Root was published by Finishing Line Press (2012). Since moving to Vermont in 2000, she has edited and designed two anthologies of Vermont poetry, Birchsong: Poetry Centered in Vermont, vol. I (2012) and vol. II (2018), both from The Blueline Press. She is a member of the Author's Guild, the National League of American Pen Women, the Poetry Society of Vermont, and is listed by Poets & Writers in its directory.